Processing tickets require often a workflow. Let’s say “if-then” activities. A ticket is from one particular customer. A ticket is assigned to an appropriate queue. A ticket has a defined priority. A ticket contains defined keywords. Outlined activities must be performed like changing the ticket priority, moving the ticket to another group, assigning a service to a ticket, and many more. Also time-based activities can be required like cleaning up the spam-queue once a week. OTRS supports this with the Generic Agent. Here, simple or compound time and event-based tasks are configurable in the OTRS front end without the requirement to learn a scripting language. Depending on search criteria, and time or event criteria, tickets will automatically be acted upon. Use this screen to manage generic agent jobs in the system. A fresh OTRS installation contains no generic agent jobs by default. 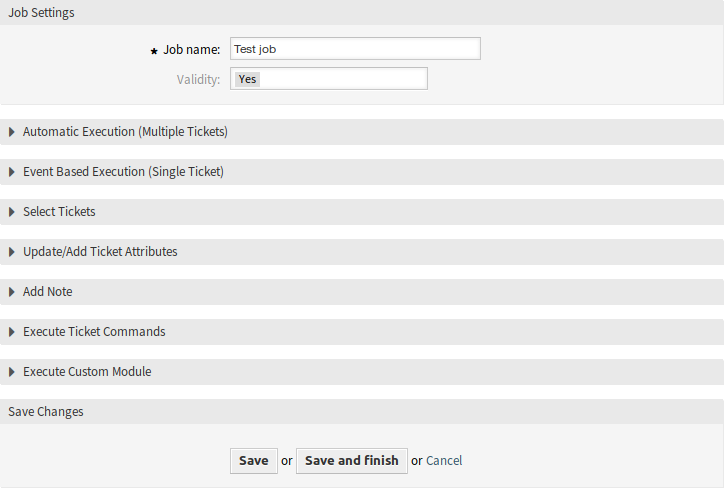 The generic agent job management screen is available in the Generic Agent module of the Processes & Automation group. Click on the Add Job button in the left sidebar. Click on a generic agent job in the list of generic agent jobs. If several generic agent jobs are added to the system, use the filter box to find a particular generic agent job by just typing the name to filter. Set the validity of this resource. This resource can be used in OTRS only, if this field is set to Yes. Setting this field to No will disable the use of the resource. Fill in this section to set the times for automatic execution of the job. Select the minutes in which the job has to be executed. For example if 10 is selected, the job will be executed in every hour in 00:10, 01:10, 02:10, etc. Select the hours in which the job has to be executed. For example if 10 is selected for minutes and 02 is selected for hours, the job will be executed in every day in 02:10. Select the days in which the job has to be executed. For example if 10 is selected for minutes, 02 is selected for hours and Fri is selected for days, the job will be executed in every week in Friday 02:10. Fill in this section to set events that trigger the execution of the job. This is a list of already added events. If no events are added yet, the list contains no elements. Elements can be deleted by clicking on the trash icon in the last column. Select an object and a related event that will trigger the job. This section contains all the attributes, that you can use to select the affected tickets. Fields are self-explained, so there is no additional explanation here. Fill in this section to update and/or add ticket attributes. 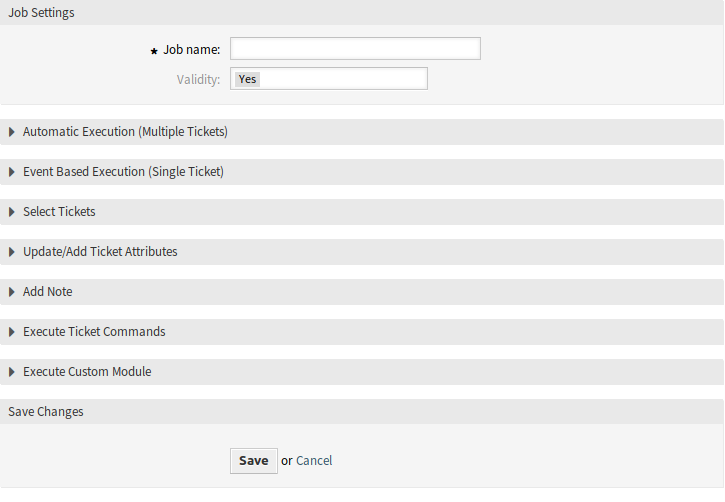 Fill in this section to add a note to tickets that are affected by job execution. Fill in this section, if you would like to make execute a custom command with the job. If Yes is selected, a notification will be sent to agents and customers about ticket changes. Enter a command here, that will be executed. ARG will be the ticket number. ARG the ticket ID. Use :: as directory separator, if the value contains a path. If Yes is selected, the generic agent job will delete the matched tickets. All affected tickets will be removed from the database and cannot be restored! Fill in this section, if you would like to make execute a custom module with the job. This is the path for the module to be executed. Enter the key of the parameter, that should be passed to the module. Enter the value of the parameter, that should be passed to the module.